[VIDEO] How Did Lord Bobo’s Minions & This Song Get Onto RadioDemokratika? We have more Fs this week to rival That Effing Show! 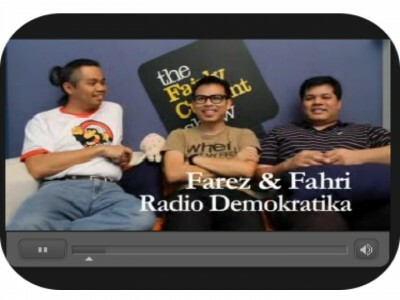 For the final episode of The Fairly Current Show this year, we get Fahmi Fadzil to chat with Farez Jinnah and Fahri Azzat, representing Radio Demokratika. Farez and Fahri talk about the upcoming CD called Radio Demokratika, and the messages that the artists in it hope to deliver. To end our series this year with a bang, we get Fahri to give us a preview of what to expect in Radio Demokratika. Radio Demokratika is an album themed on democracy and election rights, currently in progress, by the guys from MyConstitution/PerlembagaanKu. It will contain twelve songs by Malaysian independent artists including Carburetor Dung, Panda Head Curry?, Azmyl Yunor and The Maharajah Commission. One Response to [VIDEO] How Did Lord Bobo’s Minions & This Song Get Onto RadioDemokratika?